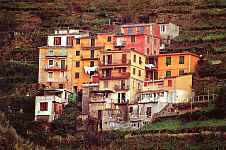 The Coast land, rough and steep, after the Gulf of Poets, north of Portovenere, has for centuries been cultivated with grapes vines and olive trees. 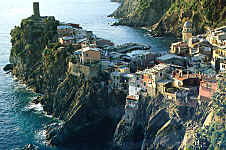 We are talking here about the Cinque Terre, where the intense sent of aromatic herb mixes with the fresh sea air. 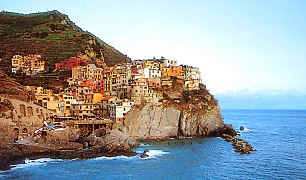 Cinque Terre, five villages like five jewels: Riomaggiore, Manarola, Corniglia, Vernazza and Monterosso, with brightly-coloured houses, steps descending steeply to the sea, roads carved through the rocks such as "via dell'Amore" ("the path of Love") between Riomaggiore and Manarola. Five villages that ask to be slowly savoured without the stress of a car. - by boat: from Lerici, Portovenere, Marina di Massa, Forte dei Marmi or Viareggio.